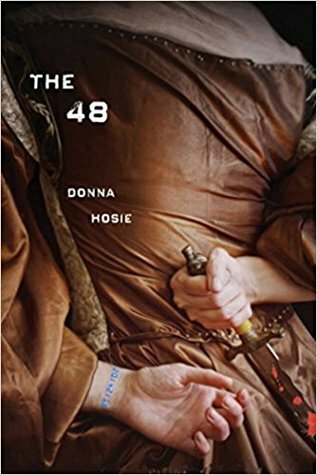 The 48, by Donna Hosie (Holiday House, October 2018) is a fun time-travel story that will especially appeal to fans of Tudor England! I was pleased to see it nominated for the YA Speculative Fiction Cybils, for which I was a panelist, because I very much enjoyed her Devil's Intern series, and though I didn't like this quite as much, it was still a good read. Some time in the future, twin brothers Charlie and Alex are young members of the 48, a secretive, almost paramilitary group that uses time travel to shape events in such a way that the influence of religion on the course of history is pruned back. The twins are thrilled to get their first assignment--travelling back to the court of Henry VIII to make sure he doesn't marry Jane Seymour (I'm not exactly sure what difference this would have made, and Charlie and Alex don't seem to be sure either, not that they give it much thought. But I was willing to play along). The 48 (the organization, not the book) doesn't pull its punches--if the marriage can't be avoided by a deft social and political manipulation, they are expected to eliminate Jane directly. But they aren't killers. Nor are they well prepared for the cut-throat machinations of Henry's court. They scramble to find their feet, though their feet, once found, keep getting swept out from under them. The court is not the only place where backstabbing and treachery is rampant. Alice, a fellow trainee and ex of one of the twins has travelled back in time too, an event that makes no sense at first, but which is tied to a rebellion to the organization. Charlie and Alex are pretty much failures at their mission. And since they finding themselves liking Jane lots, the thought of killing her doesn't appeal. Will they survive threats against their lives from the Tudor court, and the anger of their superiors if they fail at their task? Are their careers as time-travelling manipulators over before they can complete even one mission? The story is told from the alternating perspectives of Charlie, Alex, and young Lady Margaret, one of Queen Anne's ladies-in-waiting. Margaret's is the first voice, and I was a little disappointed to see her fading to somewhat peripheral, one-note character, and I would have liked Alice's point of view too! She struck me as being much smarter than the boys! That being said, the boys were engaging narrators, and I found it interesting to watch them grow up and start thinking about what they were being asked to do (and there is a sweet gay romance for one of them, which was fun). The details of the past are vivid, and lavishly applied, and in good time travel style, there's a lot of observation of all the things that are different, but there's not so much of this that it slows down the story. The plot relies on social tensions (like treachery and attempted murder) more than on major events (until close to the end), so if you like sweeping Happenings, you might find it a bit slow (I don't have this problem). disclaimer: review copy received for Cybils consideration. This is a book I might have bought for the cover alone, but your review seals the deal. Thanks for a great review.